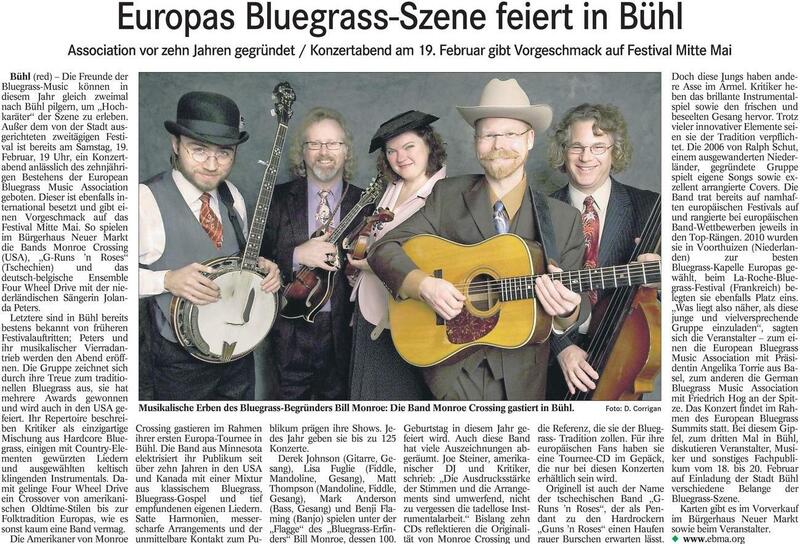 Thanks to Walter Fuchs, musical director, MC, and moving spirit of the Bühl International Bluegrass Festival in Bühl, south-west Germany, for this and other examples of the coverage given by local media to the 3rd European Bluegrass Summit. The Summit will be held in Bühl a month from now (18-20 February 2011), under the auspices of the EBMA. Dwight Worden of the IBMA will be among those taking part. The picture shows Monroe Crossing (USA), who are headlining the concert on 19 February in the Bürgerhaus Neuer Markt, on the Europaplatz in Bühl, as the culmination of their European tour next month (see the EBB for 7 January 2011). On the concert (which is presented jointly by the EBMA and the German Bluegrass Music Association to mark ten years of the EBMA, three years of the Summit, and the GBMA's first year), European bluegrass is very strongly represented by 4 Wheel Drive with Jolanda Peters and G-Runs 'n Roses, #1 European Bluegrass Band 2010. 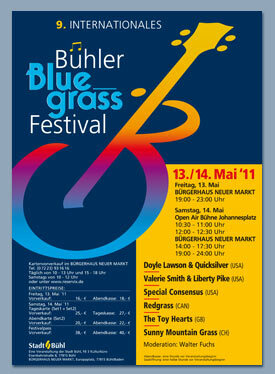 The 9th Bühl International Bluegrass Festival will be held on 13-14 May 2011 with one of the strongest programmes presented by any annual bluegrass event in Europe. Full details are on the Festival website.